Hello MBG readers! Lauren here again, happy to be back sharing a popular trend for Spring - floral. Now, I know it takes some pretty brave fashionistas to sport this look from head to toe, so I provided for you easy ways to add floral into your wardrobe without going full bloom! If you aren't comfortable with wearing floral pants, opt for floral shorts. This way you are still rockin' the trend, but aren't screaming "look at me". 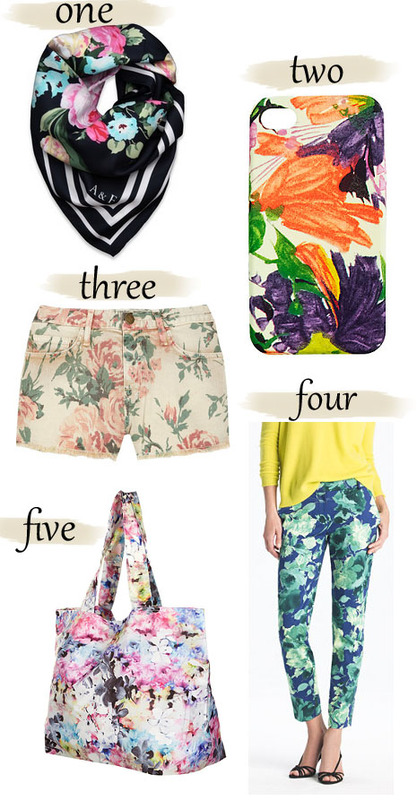 Other fun ways to add floral into your wardrobe are with a scarf, clutch, or even a blooming Iphone case! 1. Abercrombie & Fitch $55 | 2. J. Crew $25 | 3. Current/Elliott $170 | 4. J. Crew $199 | 5. Topshop $32 Will you be trying out this trend for Spring? love this post!!!! floral is so cute!!! glad its coming back around! Love that green floral pencil skirt. Totally loving this trend and hoping to give it a try! PS - I just announced an awesome giveaway & I'd love for you to enter! Love the floral trend! I have that iPhone case and get compliments all the time! Spring time! so nice. Unfortunally it´s autumn in Argentina, I´ll have to wait a few months. 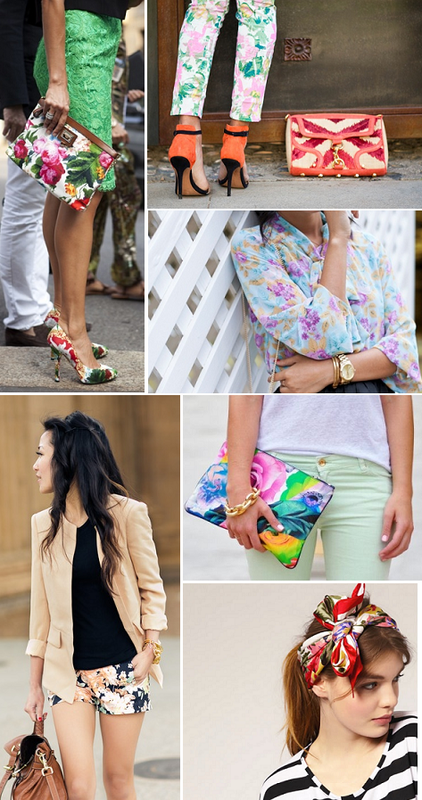 I'm loving the floral clutches these days. They are a great go-to accent for spring! SHERI ANNE: so cool you have it, i love that iPhone case too!! AMY WALTERS: I know! isn't it super cute? Just bought my first pair of floral jeans. Cant wait for them to hit my blog sometime real soon! Ha! I just spotted some similar high heel orange stilettos on Etsy..
At least the accessory to make them look similar. Nice! Loving all of the floral clutch options out there! I will certainly be partaking in the trend. I seriously love all of your floral picks, La! The pastel floral pants and bright orange heels (AND that bag mixed in) is a perfect, eye-catchy combo!